In 2018, Xiaomi’s smartphone business grew at a healthy rate of 41.3% YoY, reaching RMB 158 billion (US$23.53 billion). The increase in revenue was because of two main reasons. Firstly, the average selling price (ASP) was higher. Secondly, Xiaomi’s smartphone business had strong growth in the overseas market. Xiaomi’s ASP grew 17% in China with the help of more mid-to-high end devices in the portfolio. In the overseas market, Xiaomi’s ASP grew 10%. Despite declining smartphone shipments in China, the overseas market grew 91% YoY, based on Counterpoint’s estimates. Strong overseas shipments compensated for the slowdown in its home market. In fact, overseas shipments surpassed shipments in China for the first time in 2018, accounting for nearly 60% of total shipments. Facing a fast-changing and increasingly competitive smartphone market, Xiaomi has deployed a multi-brand strategy by separating Redmi as an independent brand from starting in January 2019. Redmi will focus on products with a high price-performance ratio, while the Xiaomi brand will focus on products with advanced technologies. However, we think that Xiaomi will continue to face headwinds in the Chinese market as it faces fierce competition from other leading OEMs. It also faces a challenge to revamp its budget brand image among consumers. 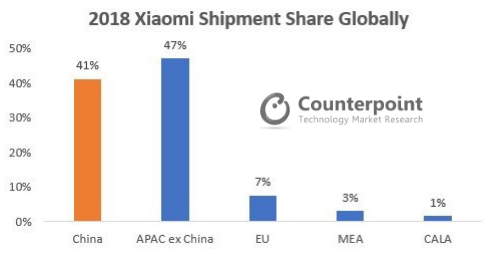 The sweet spot of growth for Xiaomi will still be in the overseas markets. To counter a slowdown in sales in its smartphone business, Xiaomi has highlighted the importance of AIoT as the dual engine of growth. Xiaomi has successfully expanded its AIoT business and connected over 150.9 million smart devices (excluding smartphones and laptops) as at the end of 2018, representing a 193% YoY increase. What sets Xiaomi’s AIoT strategy apart is that right from the start, its vision has been to create a smart home ecosystem where AIoT devices can be seamlessly connected. Over the past four years, Xiaomi has built an extensive portfolio of self-developed products as well as products from over 100 ecosystem companies in which it has invested. These products cover 30 categories in electronic appliances, 3C (computer, communication, and consumer electronics) and lifestyle products. Xiaomi’s AIoT products are gradually making a name for itself with over 50% of Mi Home App users being non-Xiaomi phone users. Xiaomi will continue to expand its ecosystem with a plan to invest RMB 10 billion (US$1.48 billion) for the development of AIoT products over the next five years. Internet services is the most lucrative business segment within Xiaomi and grew 61.2% YoY to RMB 16 billion (US$2.38 billion) in 2018. However, it only contributed 8.6% to the total revenue, remaining almost unchanged from a year ago. Xiaomi faces bottlenecks in growing its internet services revenue both in China and overseas. In China, its advertisement platforms are quite developed and extracting more revenue without hurting the user experience could be challenging. The government’s restrictions on gaming licenses also hurt Xiaomi’s revenue from gaming, which constitutes more than 15% of its internet services revenue. In addition, internet services revenue derived from overseas markets, where a large proportion of its smartphones are being sold, is still quite small. Most overseas users rely heavily on the Google Store as well as other popular overseas apps. It also takes time for Xiaomi to develop apps catered to the overseas market. Xiaomi’s challenges to significantly grow its internet services combined with its low-margin hardware business is the biggest concern for Xiaomi and takes a toll on the company’s overall profitability. Editor’s Note: Xiaomi reported its numbers in RMB. The conversion rate we have used is US$1 = RMB 6.71.